The Earth and Moon were created as the result of a giant collision between two planets the size of Mars and Venus. Until now it was thought to have happened when the solar system was 30 million years old or approx. 4,537 million years ago. But new research from the Niels Bohr Institute shows that the Earth and Moon must have formed much later – perhaps up to 150 million years after the formation of the solar system. The research results have been published in the scientific journal, Earth and Planetary Science Letters. "We have determined the ages of the Earth and the Moon using tungsten isotopes, which can reveal whether the iron cores and their stone surfaces have been mixed together during the collision", explains Tais W. Dahl, who did the research as his thesis project in geophysics at the Niels Bohr Institute at the University of Copenhagen in collaboration with professor David J. Stevenson from the California Institute of Technology (Caltech). The planets in the solar system were created by collisions between small dwarf planets orbiting the newborn sun. In the collisions the small planets melted together and formed larger and larger planets. The Earth and Moon are the result of a gigantic collision between two planets the size of Mars and Venus. 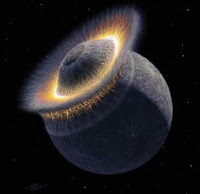 The two planets collided at a time when both had a core of metal (iron) and a surrounding mantle of silicates (rock). But when did it happen and how did it happen? The collision took place in less than 24 hours and the temperature of the Earth was so high (7000º C), that both rock and metal must have melted in the turbulent collision. But were the stone mass and iron mass also mixed together? Until recently it was believed that the rock and iron mixed completely during the planet formation and so the conclusion was that the Moon was formed when the solar system was 30 million years old or approximately 4,537 million years ago. But new research shows something completely different. The age of the Earth and Moon can be dated by examining the presence of certain elements in the Earth's mantle. Hafnium-182 is a radioactive substance, which decays and is converted into the isotope tungsten-182. The two elements have markedly different chemical properties and while the tungsten isotopes prefer to bond with metal, hafnium prefers to bond to silicates, i.e. rock. It takes 50-60 million years for all hafnium to decay and be converted into tungsten, and during the Moon forming collision nearly all the metal sank into the Earth's core. But did all the tungsten go into the core? "We have studied to what degree metal and rock mix together during the planet forming collisions. Using dynamic model calculations of the turbulent mixing of the liquid rock and iron masses we have found that tungsten isotopes from the Earth's early formation remain in the rocky mantle", explains Tais W. Dahl, Niels Bohr Institute at the University of Copenhagen. The new studies imply that the moon forming collision occurred after all of the hafnium had decayed completely into tungsten. "Our results show that metal core and rock are unable to emulsify in these collisions between planets that are greater than 10 kilometres in diameter and therefore that most of the Earth's iron core (80-99 %) did not remove tungsten from the rocky material in the mantle during formation", explains Tais W. Dahl. The result of the research means that the Earth and the Moon must have been formed much later than previously thought – that is to say not 30 million years after the formation of the solar system 4,567 million years ago but perhaps up to 150 million years after the formation of the solar system.